We were blown away last week when the Mpow Flame Bluetooth Headphones dropped to just $19.99. 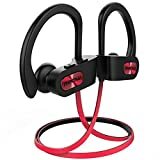 These best-selling Bluetooth earbuds offer terrific sound, great battery life, and a comfortable water-resistant design that’s perfect for workouts and running. If you missed out on that sale though, we have some fantastic news: they have an even bigger discount today. The light gray version of the headphones can be had for just $16.79 if you use the coupon code VJQK3X4N at checkout. Or if you prefer the black and red color, they’re $16.99 today with no coupon required.